“Late last week, the U.S. national debt topped twenty trillion dollars for the first time in history. Instead of debating how Congress could take action to reduce the risk of default and substantial payments our grandchildren will inherit, Congress continues to encourage reckless spending and unaccountable taxpayer-funded programs. Rather than making the hard choices now, we are forcing Americans into an even tougher situation in the future because of this rising debt. “I am very thankful for the opportunity to have shared my conservative outsider message with the citizens of CD-5. Although we came up short on results, I believe we were successful in making this election about the issues rather than political hand-offs. Voters want to know their representatives are not taking them for granted. “I want to thank my supporters, volunteers and staff for devoting their time, talent and treasure to this campaign. They carried the weight of this endeavor and to them, I am indebted. “I congratulate my opponent, Senator Andy Biggs, and wish him the best in the General Election. “The General Election is rapidly approaching and there is much work to be done to elect Republicans in local, state and national elections. We must not take anything for granted, especially the trust of the voters. This election will be critical to restoring the economy, jobs and national security to America. We must win. (Gilbert, AZ) – Today, the Jones for Congress campaign released its latest commercial, “Gaggle,” in the Republican Primary race for CD-5. The ad features a gaggle of career politicians competing for attention contrasted against successful conservative business leader, Christine Jones. In the ad, Jones asks the gaggle if they have created any jobs or balanced any budgets. They haven’t. She also discloses she hasn’t taken any special interest money. The career politicians clamor that they have. The ad is an accurate portrayal of the CD-5 race. Conservative business leader Christine Jones landed a significant endorsement Tuesday evening when the campaign released a video of Governor Mike Huckabee endorsing her campaign for Congress. The former Arkansas Governor and Republican Presidential candidate produced a personal video message from his office that he made public through the Jones campaign Facebook page on Tuesday evening. In his message, Governor Huckabee speaks glowingly of his friend Jones and advises voters to beware of Washington elitists who are afraid of Jones because she can’t be bought. “She’s my friend. She’s someone I know, someone I trust and someone I believe that when you send her to Washington, you’ll know, you have someone who’s fighting for you, not someone fighting just to keep the special interest and the status quo alive and well,” Huckabee remarks. According to recent polls, Jones is leading in the GOP primary against her three opponents. Voters are currently casting early ballots as Primary Election day approaches on August 30th. Visit Christine Jones website for more information. View Governor Mike Huckabee’s video message below. Was Congressman Matt Salmon’s Staffer Politicking on Taxpayer Time? Every member of Congress and their staff is constantly reminded – especially during election years – that using official government time and resources for partisan politicking, is strictly forbidden. It’s a simple rule. Don’t spend your time and don’t use taxpayer-paid computers, phones, etc to engage in election activities. Taxpayers don’t want staff working to elect or defeat while they’re on the taxpayer’s dime. So why would a member of Congressman Salmon’s staff spend time politicking on official time? The following screenshots were obtained from Facebook and show Salmon staffer Lee Huff making political posts in support of Salmon’s hand-picked successor, Andy Biggs. 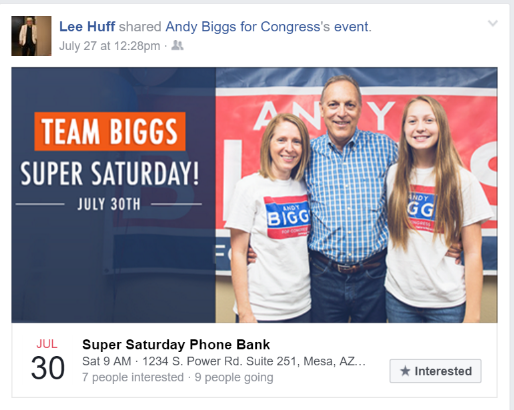 In the first screenshot, we see Lee Huff on Facebook sharing a post to an Andy Biggs political event. The post was made Wednesday, July 27th at 12:28 PM. Lee Huff works for Congressman Matt Salmon, who works for the taxpayers of CD-5. The next screenshot shows a post from Thursday, July 28th at 10:14 AM from Gilbert, Arizona. Congressman Salmon’s office is located in the heart of downtown Gilbert. Lee Huff resides in Mesa. The content of the post is an attempt at a negative association of Christine Jones with Barack Obama. It is clearly electioneering at 10:14 in the morning from Gilbert, Arizona. 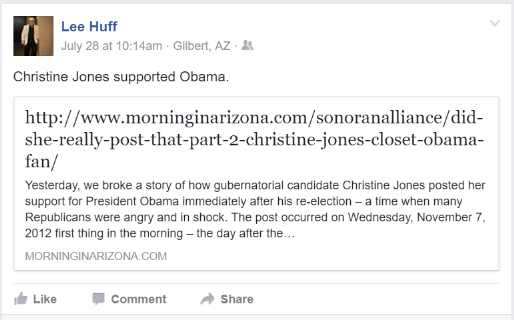 The final screenshot shows Lee Huff on Facebook posting on Tuesday, August 2nd at 2:29 PM from Gilbert. This time, the post is an effort to drive web traffic to a dark money-sponsored organization’s website that is trying to mislead voters about Christine Jones. The question I have is who does Lee Huff work for? Is it Congressman Matt Salmon? 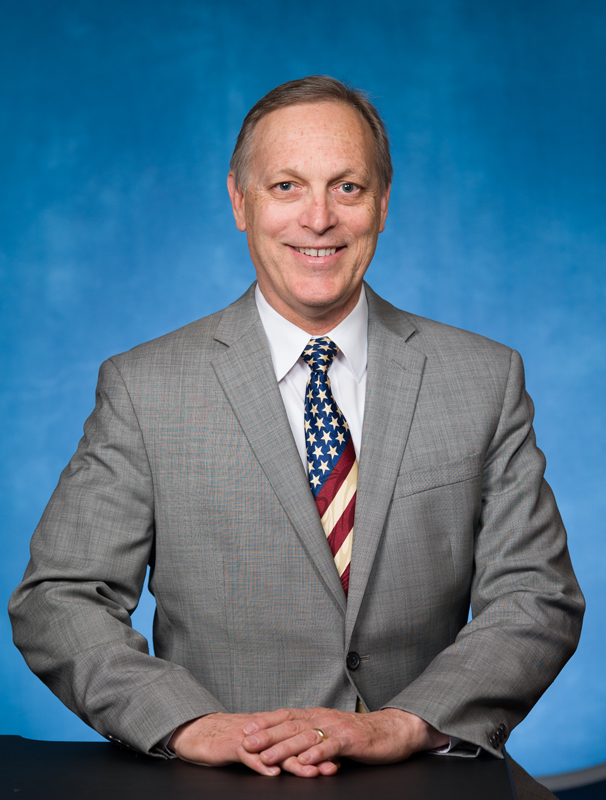 Is it Matt Salmon’s heir-apparent, Andy Biggs? Or, is it the taxpayers who pay his congressional staffer salary? Perhaps Lee Huff was off the clock? Maybe using a little vacation time? Maybe he frequents Gilbert coffee shops? I think he has some explaining to do to us watching this election and to his boss, the US taxpayers. You may have seen or heard political ads attacking Christine Jones over comments she made regarding Hillary Clinton and Barack Obama. A Washington insider group cherry-picked comments from her social media, intentionally took them out of context and twisted them into a hit and run political commercial. This group is now spending hundreds of thousands of dark dollars in false advertising to attack Jones under the mantra of guilt by association. This political insider group wants the average viewer to believe that Christine Jones is a Democrat-sympathizer whose loyalty to the Republican Party is in doubt. Nothing could be further from the truth. These political ads are false. Voters in Congressional District 5 should know that Christine Jones is a lifelong Republican who oftentimes tells voters that she went out of her way to visit the DMV on her 18th birthday to register as a Republican. She’s been loyal and dedicated to the GOP for nearly three decades. For those who do their homework on Christine Jones, they’ll note that she committed to support the nominee of the Republican Party months ago. They’ll also note that as recent as two weeks ago, she blasted Hillary Clinton on multiple charges including, the email scandal, the Clinton Foundation, the Clinton Speeches and Hillary’s failure and cover-up of the Benghazi murders. How much did Christine Jones’ opponents donate to the Mitt Romney Victory Fund in 2012? According to FEC reports, zero dollars. That’s Z-E-R-O. The truth is that Washington insiders are seeking to hand-pick a career politician to succeed outgoing Congressman Matt Salmon. They’re spending hundreds of thousands of dollars to smear a lifelong, loyal conservative Republican who has a proven record of fiscal accountability and effectiveness. This election, don’t fall for the dark money false advertising by the Washington elite. If all they’ve got is a few tweets taken out of context, they’ve got nothing. A 30-year commitment to conservative principles means something and shouldn’t have to compete against a 30-second distortion. Christine Jones is a true conservative Republican who won’t be bullied by political insiders and will fight for you in Congress. 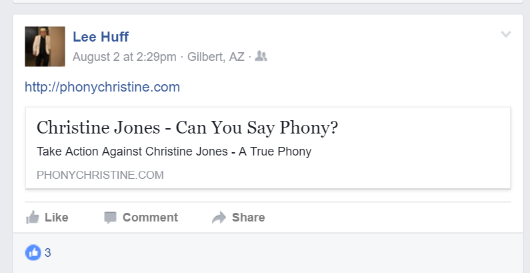 Recently, it came to my attention that two Gilbert pro-life activists supporting Andy Biggs are circulating an email attacking the sanctity of life position of my friend, Christine Jones. I understand that. It’s election time and being a little over zealous comes with the territory. For those who vote for a candidate based on a single-issue, each of the Republican congressional candidates running in CD-5 have identified as pro-life. As the former Executive Director of Arizona Right to Life and someone who has been a part of the Arizona landscape of the pro-life movement for over two decades, I am supporting Christine Jones and have joined her team for Congress. I only support and work for pro-life candidates and that’s a deal-breaker for me. I also believe strongly that if the pro-life movement is going to win – especially in the public relations matrix – we need to elect more pro-life women to office. I’m not alone. Organizations such as Susan B. Anthony List focus on electing pro-life women to office around the country. Other pro-life activists, culture warriors and faith leaders also support Christine Jones. In fact, Monday, she announced the endorsement of three well-known pastors who shepherd huge churches in the East Valley. These leaders in the faith know Christine well and know she can be trusted with issues as fundamental as the sanctity of life. As you cast your vote for Congress, remember no other right is as sacred as the first and foremost right to life. Christine Jones will defend and protect that right for the unborn and their mothers because she is pro-life. (Gilbert, AZ) – Today, East Valley Pastors Tom Shrader, Gary Kinnaman, and Kevin Hartke all endorsed Christine Jones in her bid for Congress. Jones, a technology and business leader, has attended church in Chandler for nearly 20 years and has been an active and supporting member of the faith community in Arizona.